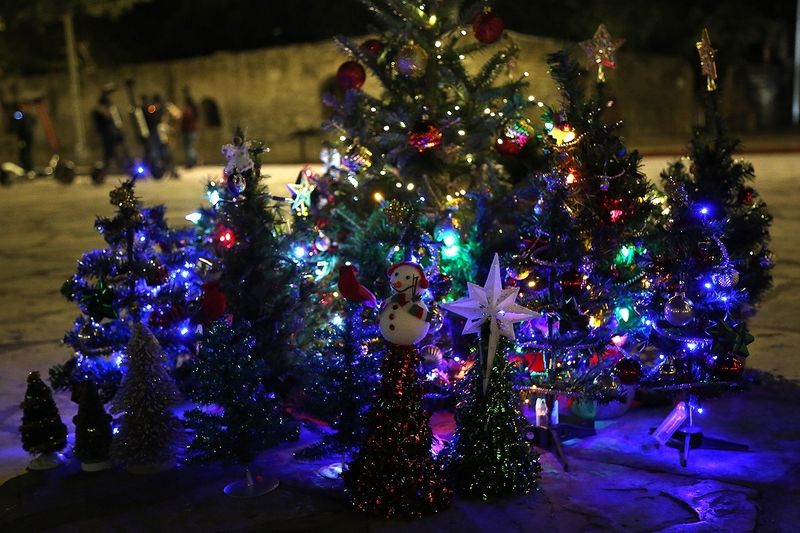 For the second year, as the 50-foot H-E-B Christmas tree towered over Travis Park, downtowner Steve Monreal inspired much smaller versions to pop up at Alamo Plaza. 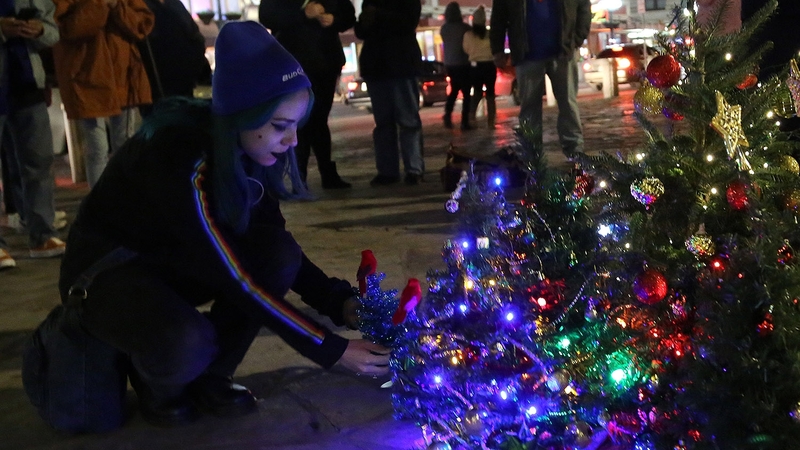 Early Sunday evening, people brought 32 little Christmas trees and clustered them together on the very spot where downtown’s official tree stood for more than 30 years. 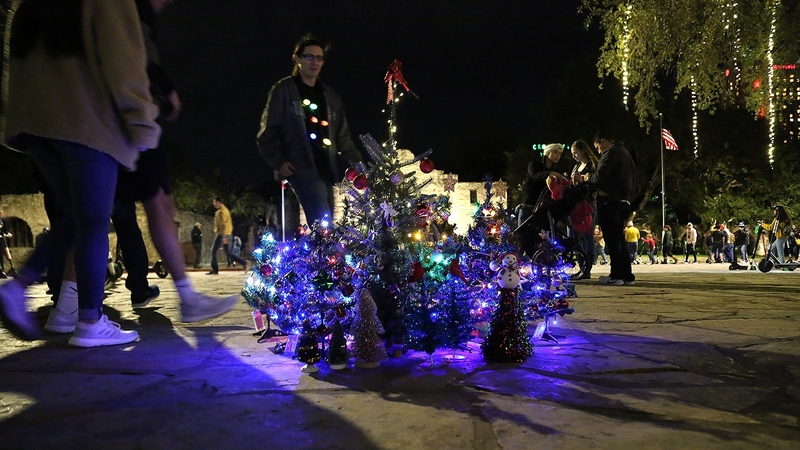 The gathering was a protest of sorts of the decision last year to relocate the H-E-B tree from Alamo Plaza to Travis Park. 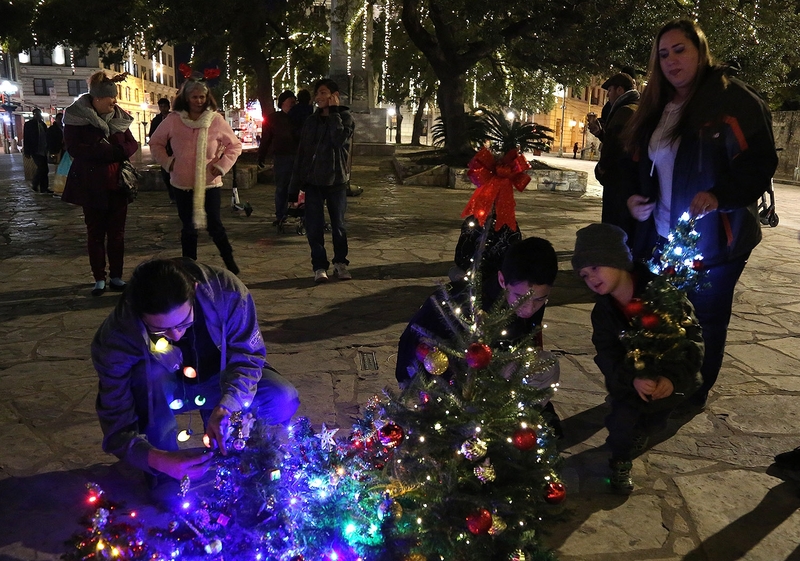 Monreal, the gathering’s organizer, had hoped for 300 small trees to occupy the plaza in celebration of San Antonio’s tricentennial. 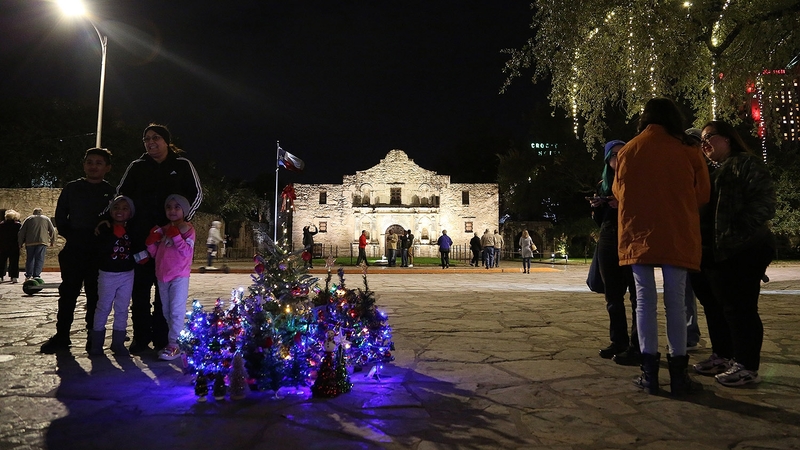 That said, he was happy to bring some joy to those passersby who stopped to take photos with the trees with the Alamo in the background, just as they would if the 50-footer was standing there. “That alone is enough,” said Monreal, who clustered the trees together because the wind kept knocking down some of them. Last year, officials with the city, H-E-B and Centro San Antonio decided to relocate downtown’s largest tree. 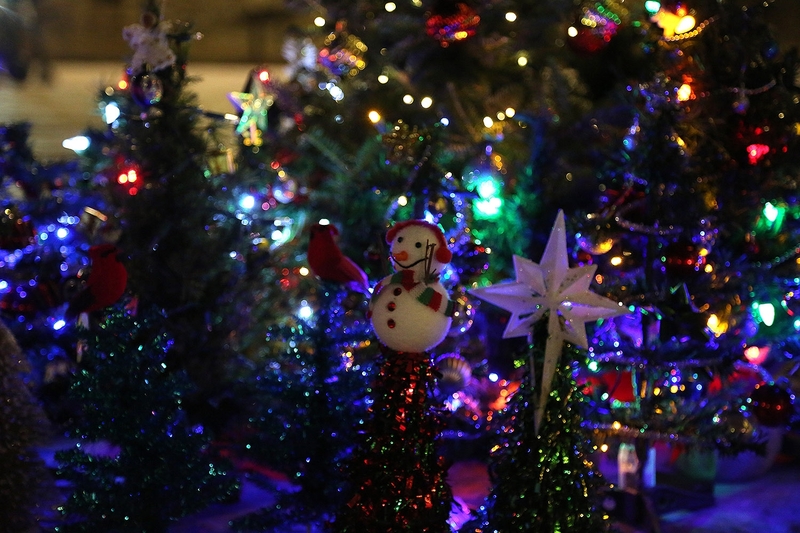 They said Travis Park fit more people, and it also offers a better setting for continuous holiday programming—such as movie nights, Santa visits, etc.—throughout the season around the tree. “The move to Travis Park created an action packed holiday season with holiday activities and entertainment, and we will continue to offer exciting programming for all ages this year in Travis Park,” said John Jacks, director of the Center City Development and Operations department. 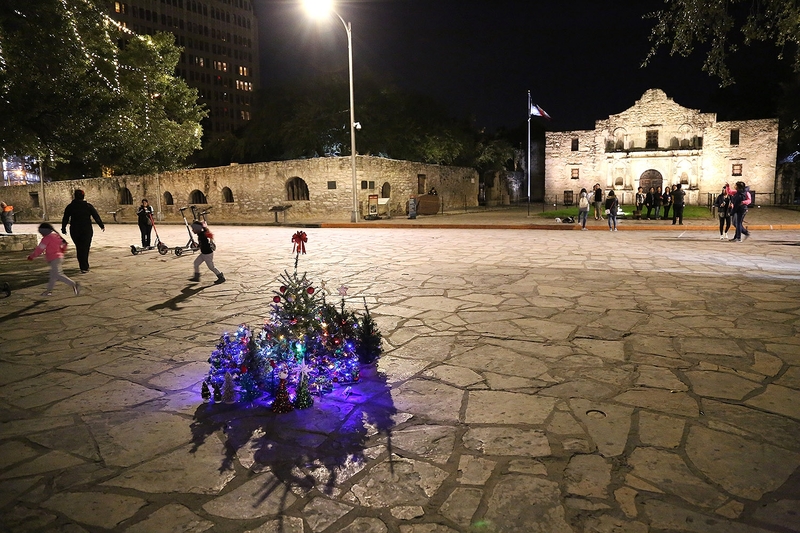 The tree would have to move in upcoming years anyway, because of impending construction to Alamo Plaza, they said. But city officials decided to bring back the tree to Travis Park because, they said, last year was such a success. District 1 Councilman Roberto Treviño said it’s too early to tell if the main 50-foot tree will return to the plaza after renovations are completed in five years. “All those things will be under the consideration of the new board that will be formed for the Alamo Plaza,” Treviño said. 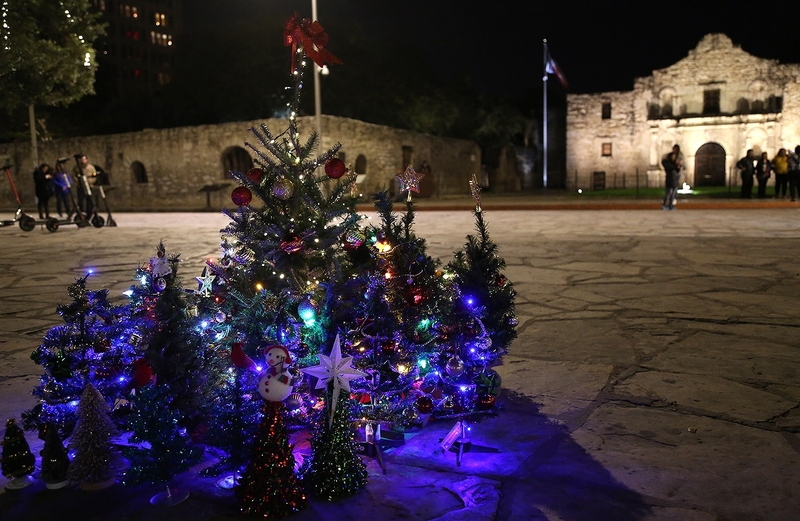 This year, H-E-B has purchased a 20-foot Christmas tree for Alamo Plaza, which will be installed Monday, city officials said. 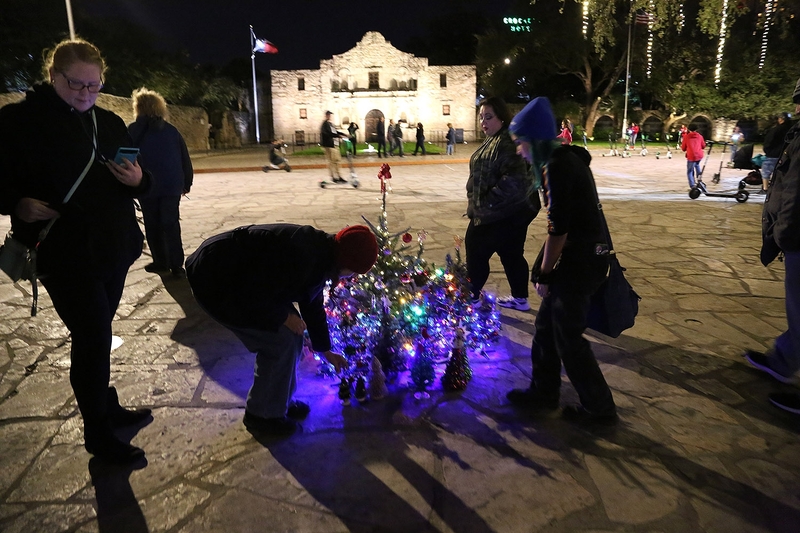 The company made the same offering last year, and eventually, Alamo Plaza received a tree. But for Monreal, the move didn’t come fast enough. Monreal, a server at a downtown restaurant at the time, stepped in by placing a small Christmas tree on the plaza. It wasn’t a protest so much as Monreal wanted to fill what he described as a feeling of emptiness. The Christmas spirit that usually filled the plaza, he said, wasn’t there anymore. 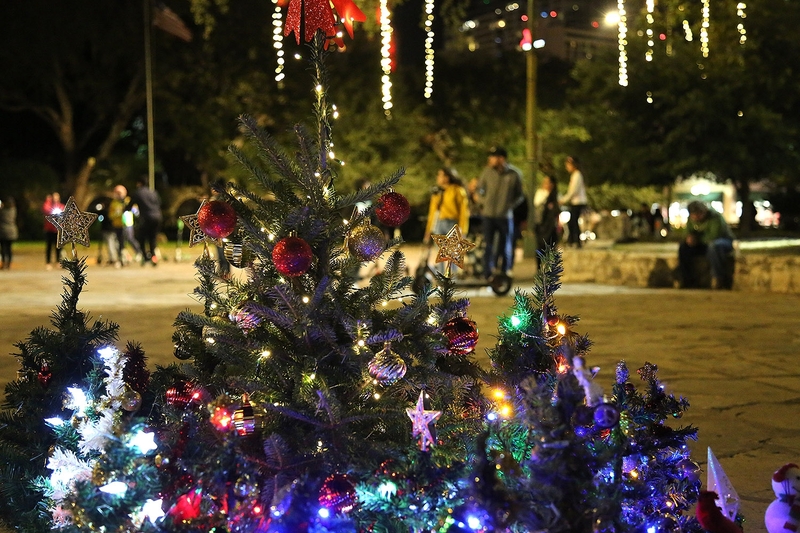 By the time the Travis Park tree was lit the day after Thanksgiving, a few others Monreal’s tree via social media, and contributed their own. Meanwhile, over at Travis Park. 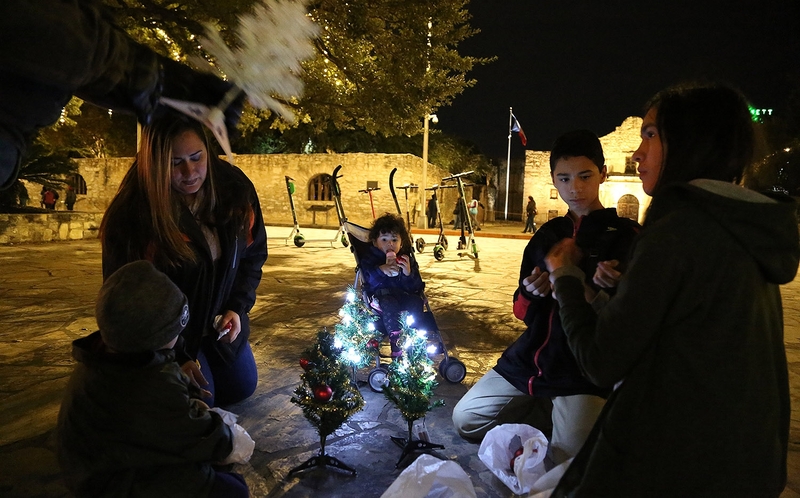 On Sunday night, Monreal, and most others who gathered around the miniature winter wonderland, spoke solemnly and said they believe this kind of social gathering will be lost after the multimillion-dollar Alamo Plaza renovation is completed in 2024. “We might not be able to have this anymore,” said Monreal, as strangers stopped to take photos and kids whipped around the plaza on scooters. During public meetings this year on the Alamo Plaza master plan, city officials insisted that the plaza would remain a public space. The plan, which was approved by the City Council in October, will rail off the plaza using some type of barrier and convert the plaza into a kind of open-air museum. During museum hours, visitors—locals and tourists, alike—would enter through one main entrance around where the visitors’ center is currently located in the Crockett building oppose the shrine. During non-museum hours, six entrances would open up, and people would be able to access the main space in front of the Alamo, officials said. When asked whether her family had visited Travis Park this season, Varela’s husband, Ted, chimed in. 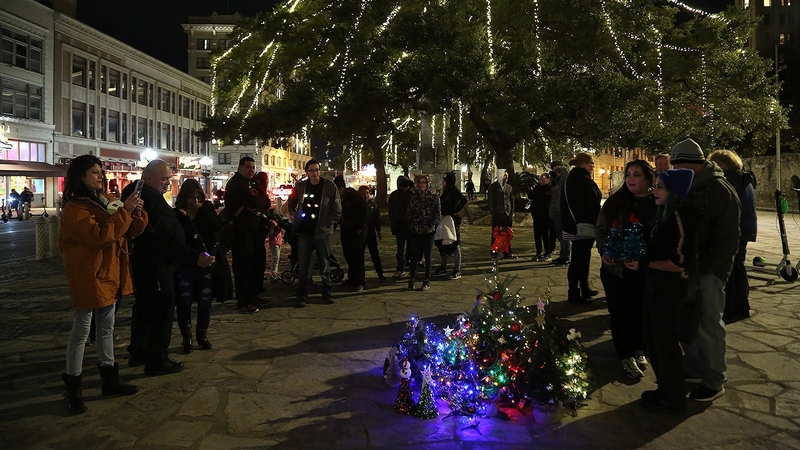 On the @downtownsanantonio Instagram account, the Heron’s sister site, more people seem to be in favor of Alamo Plaza as the location for downtown’s primary Christmas tree. But the Travis Park location has its supporters, as well. It’s officially Christmas time in San Antonio. ¡Feliz Navidad! 🎥 @satxphotojournalist Follow @sanantonioheron for more pics and video throughout the evening. 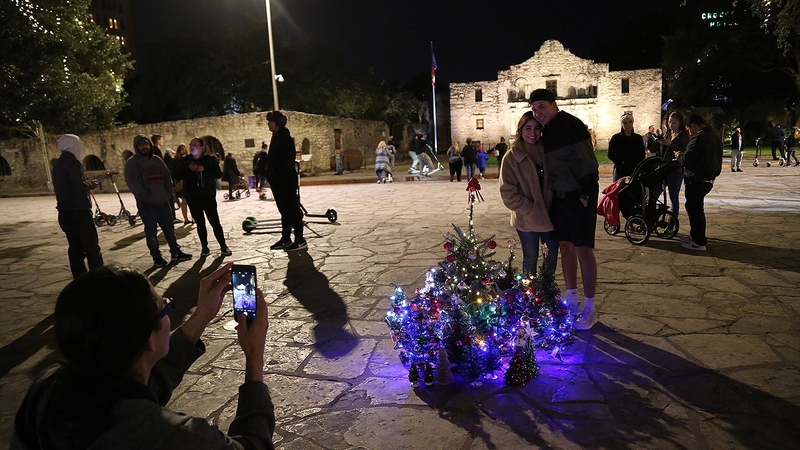 Setting It Straight: An earlier version of this article incorrectly estimated the number of mini Christmas trees that were placed in front of the Alamo Sunday night. There were 32.